Despite a history of several decades of pesticide regulation, continuous innovation, and considerable practical experience with using pesticides in agriculture, the environmental impact of pesticide use continues to be of serious concern. Frank den Hond and Peter Groenewegen are at the Faculty of Social and Cultural Sciences, and Nico van Straalen is at the Faculty of Earth and Life Sciences, all of the Vrije Universiteit, Amsterdam, The Netherlands. 1 Questions Around the Persistence of the Pesticide Problem (Frank den Hond, Peter Groenewegen and Nico M. van Straalen). 2 An Agricultural Vision (Paul C. Struik and Martin J. Kropff). 3 The Authorisation of Pesticides in the Light of Sustainability (Elizabeth Vogelezang-Stoute). 4 Innovation in the Agrochemical Industry (Frank den Hond). 5 Regulatory Science in an International Regime: An Institutional Analysis (Alan Irwin and Henry Rothstein). 6 Farmers' Agrochemical Use Decisions and the Potential of Efficiency and Innovation Offsets (Ada Wossink and Tanja de Koeijer). 7 Variations in Agricultural Practice and Environmental Care (Geert R. de Snoo). 8 Assessing the Environmental Performance of Agriculture: Pesticide Use, Risk and Management Indicators (Kevin Parris and Yukio Yokoi). 9 Integrated Assessment of Pesticides: Methods for Predicting and Detecting Environmental Risks in a Safety Net (Harrie A.J. Govers, Pim de Voogt, Pim Leonards, André van Roon and Onno Kwast). 10 Site-Specific Pest Management (Scott M. Swinton). 11 New Biotechnology, Crop Protection and Sustainable Development (Susan Carr). 12 European Food Industry Initiatives Reducing Pesticide Use (Nicolien M. van der Grijp). 13 Impact of International Policies (CAP) and Agreements (WTO) on the Development of Organic Farming (David Barling). 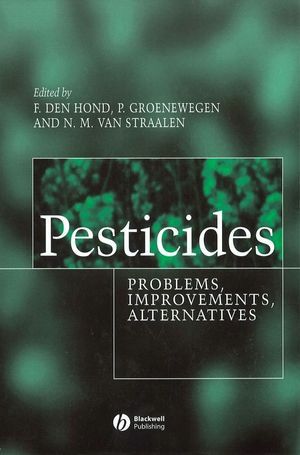 14 Integration: Learning to Solve the Pesticide Problem (Peter Groenewegen, Frank den Hond and Nico M. van Straalen).